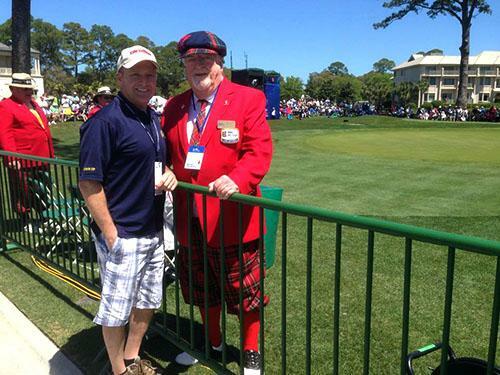 I had originally planned to go on Sunday to watch the final round and be there for the donning of the plaid jacket and presentation of the RBC Heritage Championship trophy. I woke up at 7:30am Saturday, feeling like I had slept the day away. Made a pot of coffee, had some breakfast, checked the weather. I knew it was supposed to be windy and about 70 degrees. I remember a coworker telling me that Saturday was the best day at the Heritage because no one has to go home and Harbour Town rocks after the final pairing finish their 18. So I decided to put on my only plaid shorts, a fresh layer of sunscreen, and head over to Sea Pines. My best option was to avoid the traffic by parking at Honey Horn and take the shuttle to the south side of the Island. The line snaked for about 200 yards but in less than 15 minutes I was on a bus merging onto the Cross Island Parkway. Shuttles were moving like clockwork. During the bus trip, Ted the tour guide provided Hilton Head and Honey Horn facts sprinkled with updates and more facts about the RBC Heritage. He pointed out an alligator as we pulled into Sea Pines much to the ear piercing delight of the two young boys across the aisle on my right. For me, the Heritage was the tournament after the Masters. I knew it took place on Hilton Head Island, but I’ve been living in Portland, Oregon for the last 20 years. I moved to the Portland area after graduating from the University of South Carolina. I have deep roots in South Carolina, specifically in Williamsburg County. My Mom, brother, sister and their families still live in Kingstree where I went to high school, so coming back to S.C. was coming home for me. I’m the new guy. New to Spinnaker Resorts, new to Hilton Head, and this is my first RBC Heritage. So I’ve been doing my homework. Checking out the island, restaurants, beaches, and golf courses. I play golf, not well, but I play. I don’t call myself a golfer because I think that denotes professionalism and talent that I will never possess. Hooked you might say. I always seem to have a few shots that make me think, “I’d be pretty good if I just played more and spent more time on the driving range.” Wouldn’t call myself a fanatic but I follow the PGA Tour, sometimes. I even watch tournaments on TV these days, every now and then. In my case I guess it’s an acquired admiration for the game. In my 20s I would have told you watching golf was boring and I would rather be surfing, camping, anything rather than watching other people play the game. Which wasn’t really a valid argument because I’ve always loved watching football, basketball and baseball. And many have argued with me that watching baseball is more boring than watching golf. But when I had the opportunity to attend the Heritage, I jumped on it. 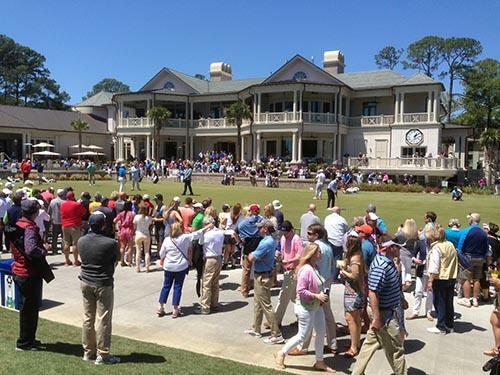 A chance to see some of the best in action, live and in person, in South Carolina’s only PGA Tour event. To hear the blast of a 300 yard drive. Watch a little sand trap magic from David Toms. He is ranked #1 in “sand saves” in 2016 after all. But that also means he must land in bunkers frequently. Giants of the game have played here. Arnold Palmer won the first Heritage in 1969. Jack Nicklaus won in 1975. Watson has won twice, Davis Love III has won five times. When we stepped off the bus at Harbour Town, we walked past the array of shops and around to the Clubhouse. After standing in line for a few minutes a young lady with a clipboard asked if there were any military members in line. I’m a Chief Petty Officer in the Navy Reserves with tours in Afghanistan and Africa. I walked around to the Will Call booth with a few other Veterans and received complimentary day passes. Pretty sweet. I’m still amazed from time to time with military appreciation and the generosity of people and businesses. A few weeks ago I was driving back from my monthly drill weekend in Charleston. Still in uniform and hungry, I stopped in a sandwich shop on Hilton Head and placed a takeout order. When my order came out, the waiter told me my bill had been paid. Two women I had never met picked up my tab. I shook their hands, humbled by their gesture. Back to the Heritage. I haven’t seen this much plaid since I watched the Highland Games in Portland. I learned the Heritage Plaid is accredited by the Council of the Scottish Tartan Society, designed by Kinloch Anderson for the officials and winning jacket for The Heritage golf tournament. My first stop was the practice green. A crowd gathered around a few players that I honestly didn’t recognize without looking at the name on their bag or the back of the caddie’s vest. I moved over to the driving range. Saw Zach Johnson, Lucas Glover, and the unmistakable beard of Graham DeLaet. Off to the left was the rookie, Bryson DeChambeau who finished tied for 21st at the Masters. He qualified for the Masters by winning the 2015 U.S. Amateur Championship, plus he won the NCAA Championship. Aside from leaders Jason Day, Charley Hoffman and Luke Donald, the larger crowds on Saturday were following DeChambeau. I watched Branden Grace and Tony Finau tee off on the 1st hole. Had never seen nor heard of Finau but he crushed his drive. Had to Google him on my phone and found out he’s currently second in the PGA in driving distance. During the opening round his drive on the 332-yard, par-4 ninth hole rolled within 4 feet of the hole. As far as Branden Grace, little did I know on Saturday that he would rally on Sunday to win the Heritage. I moved over to the 9th fairway and witnessed Greenvile, SC native Bill Haas hit a fantastic approach shot. I stayed to see Boo Weekley walk up to 9th green to cheers of “Booooo” from the crowd. Afterward I introduced myself to Charles Perry, the Chairman of Announcers, who has been at it for almost 30 years holding down his spot on the 9th green. Of course I got a picture with the legend. I was already hungry so I made my way over to the 16th hole. A long list of “Patriot Partners” had sponsored covered seating for military members and vets. It was near the green with a view of the fairway dog leg as well as the 17th tee. Calibogue Sound in the distance. Food and drinks and a great view. Doesn’t get any better. I met Pete Hyers, retired U.S. Navy Captain and helicopter pilot, and current Hilton Head Council President of the Navy League of the United States. It was a mix of Vietnam Veterans wearing their signature ball caps adorned with pins and younger, still active duty members sporting tattooed forearms. Something about hanging out with vets makes me feel a little older, though I just turned 50. The sense of pride makes your chest swell a bit and warms you on the inside. Even just a subtle head nod of recognition and you can tell in their eyes they know we’ve walked a few steps in each other’s boots. From this vantage point I witnessed Aaron Baddeley’s bunker shot on 16. The enormous fairway bunker on 16 was landing spot for a dozen golfers in the third round. After an amazing draw from the fairway trap, around the dog leg, his ball rolled across the green into another trap. He punched it out within a foot of the hole to save par. The Heritage Lawn between #16 and #18 was filled with vendors passing out samples, taking souvenir photos, and best of all a phone charging station. Waiting for my phone to charge I could hear that familiar blast of driver meeting golf ball, not from tournament players but from the Bridgestone Performance Center with display clubs to test in their simulator. Very popular booth. Speaking of the sounds, I always wondered how they get the sound so crisp during televised tournaments. Strategically positioned near the tee boxes, along the fairways, and around the greens are large microphones that look like ferrets lying in the grass. I decided to backtrack to #10 positioned across the cart path from the 16th fairway. I was watching Charley Hoffman about to putt when the engine roar above caught everyone’s attention. Heritage sponsor Boeing had a 787 Dreamliner emblazoned with Vietnamese Airlines logo perform a scheduled flyover The pilot circled twice, climbing to the point it almost appeared the plane may stall. Play halted and the crowd was somewhat surprised, unsure if this was planned. I heard a woman ask “Is the pilot showing off?” I don’t know if it made a difference but Hoffman bogeyed the hole. Matt Kuchar from Sea Island, GA, and 2014 Heritage Champion, got a rousing welcome as he walked up to the 16th green after his approach shot landed pin high within 12 feet of the hole. Hoffman had a great drive on 16 past the tree in the center of the fairway and well away from the ominous sand. Dropped his approach about 20 feet from the hole and drained the birdie putt to take the lead. Best drive on 16 was Kevin Chappell. It was about 325 yards (I checked it on an app). The tree in the center of the fairway was a nuisance to many that day, including DeChambeau. 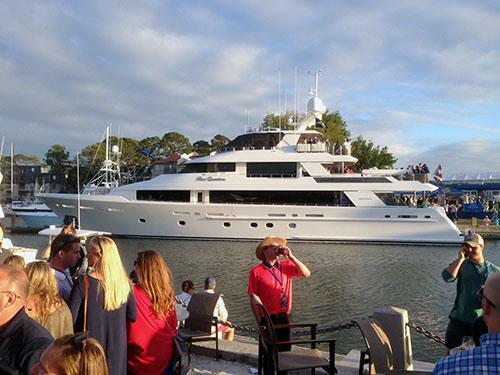 After Jason Day and Kevin Chappell completed the last rounds of the day, I decided to walk around Harbour Town. Had an adult beverage, listened to some live music, and just soaked up the atmosphere of people and the incredible sunset. Yachts that looked more like small cruise ships had premier parking in boat slips mere steps away from the lighthouse and 18th green. On the bus ride back I sat next to a lady named Joanne, a 30 year resident of the Hilton Head area. She was dressed head to toe in black and white, matching Coco Chanel purse, and a hat that looked more appropriate for a day at the Kentucky Derby. She filled the ride back to Honey Horn with stories of how things have changed over the years around Hilton Head and Bluffton. I’m sure if that bus was headed for Miami she would still be filling my ears with the way things used to be. But it wasn’t necessarily a negative commentary on progress or differences between generations. It was more nostalgic. I imagine it will be like that for me, when I come back to see the Heritage in years to come. Sharing stories of how it was when I saw my first tournament. When I saw Hoffman chip in from the fringe on 16 to go to -8. When Jason Day’s drive on 18 came to rest 3 feet directly in front of me. And yes, I texted my brother as soon as that happened. I noticed that there was not a typical fan or attendee to the Heritage. I saw Baby Boomers in plaid, Generation Xers with kids in tow (also in plaid), 20-year-olds gathered at various holes (golf holes and drinking holes). And the ratio of men and women were split pretty evenly. I probably saw just as many groups of women as men meandering through the crowd. The event was part tailgate party, fashion show and sporting event. Just as any sporting event I’ve attended, you hear commentary from the crowd of young and old experts, weighing in on what club will be used for the next shot, and stats on what this particular player’s average driving distance is this year. Sunday I opted to watch the final round from the comfort of my recliner. I watched the run by Branden Grace to win his first PGA event. I cheered for Jason Kokrak through the pain of watching his bogey on 18 to drop to a tie for 6th, which cost him about $60,000 in prize money. I was impressed by the play of Bryson DeChambeau in his first PGA tournament. He barely missed multiple birdie opportunities. He was in contention all weekend. Several sand saves by Luke Donald to hold on to a tie for 2nd. But while I watched I couldn’t help thinking I should have been there on Sunday. All the things I told myself I needed to do that day now seem trivial when I could have been back there watching it live. I know you can’t possibly see everything. You have to choose your holes and who to follow. You see some amazing shots, and hear the crowd in the distance witnessing magic on another hole. The Heritage will return next year. And so will I.